National Day may be over, but the celebration of our nation’s best craft makers never stops. And there’s probably nowhere better to find unique locally-made goods than at Carousell, our favourite online community marketplace. Except maybe Carousell’s annual flea market, Carouselland. 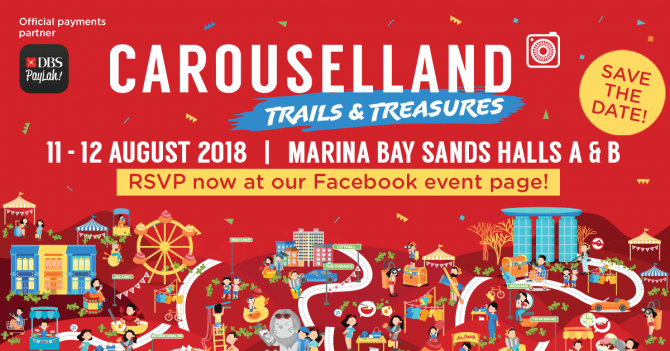 Happening on 11 and 12 August, from 12pm to 9pm at the Marina Bay Sands Exhibition Halls, Carouselland is set to wow you with their biggest ever bazaar featuring 400 curated booths by sellers from all over the region. Vintage clothes and accessories, retro collectibles, handmade gifts, succulents, home décor, toys for babies… you name it, the bazaar will most likely have it, brand new and pre-loved. This year, Carouselland invites you to go hard with your support for local creators. Stop by the dedicated Local Pride section to meet our inspiring young entrepreneurs and influencers like Rachel Lim from Love, Bonito and Sylvia Chan from Night Owl Cinematics. They’ll be conducting workshops and sharing all about how to be a business #bawse. With exciting games and delicious food, Carouselland is where we’ll be hanging out all weekend.